Have you ever been looking back on a day only to realize that you don't really have any idea what took up all your time? Lately I've been having that feeling quite often, and I hate it. I have very little free time as it is, and I certainly don't want to lose it all because my mind has been on autopilot. Things have certainly improved some since I started my Bullet Journal. I'm better at knowing what I'm going to tackle each day, but the time that hasn't been planned still tends to get lost to memory. 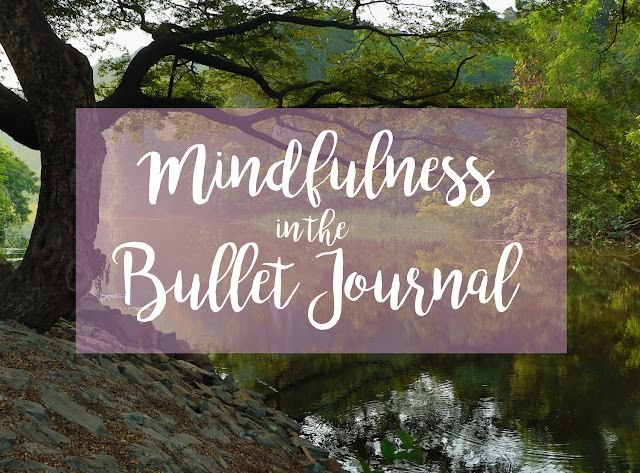 To help remedy this problem and reclaim my free time, I've started looking into different mindfulness techniques and how to incorporate mindfulness in the Bullet Journal. Simply put, mindfulness is just being aware. Nothing more, nothing less. It's a fancy term for recognizing and acknowledging your feelings and thoughts while you're in that moment. It's not about controlling or changing any of those sensations, just perceiving them. So how do you go about becoming more mindful? Well, just like everything else, it requires dedicated practice. When a runner trains for a hurdling race, she works on not only her speed, but her form and technique too. She then puts them all together and ends up with a better performance all around. Similarly, you have to develop and strengthen the building blocks of mindfulness first, and then you can apply them to your everyday life with greater results. Typically, mindfulness is practiced through meditation. I had always thought that meditation was this inaccessible practice with lofty goals. I was surprised to learn that it's much simpler than I thought! If being mindful is just the state of being aware, meditation is simply spending time practicing awareness. At it's core, meditation is just sitting and observing. Of course there are a multitude of meditation approaches and goals, but I was previously unaware that such simpleness existed in the context of meditation! When I first started looking into mindfulness and meditation, I came across a service called Headspace. Andy Puddicombe, the founder, has definitely had a very interesting life. He left school to become a monk, hoping to learn to calm his indefatigable mind. After practicing in several monasteries around the world, he transitioned back to regular life in order to get a Circus Arts degree. Who even knew that existed?? I bought his book, Get Some Headspace: How Mindfulness Can Change Your Life in Ten Minutes a Day (This is an affiliate link, which helps me get a small commission at no extra cost to you. Thanks for the support! ), in order to get a base knowledge of the practice of meditation. I liked that the book didn't put on any airs about the subject of meditation. Things were kept simple, direct and unpretentious. He also incorporated a bit at the end of each section for scientific studies regarding meditation and mindfulness. The facts-oriented approach definitely helped get me on board. Headspace recommends starting with ten minutes a day of meditation. When you begin, you start by checking in with your body and mind. This helps your brain calm down and gets you prepared for the practice. You start with a soft focus of the eyes, taking in what is around you. You can then shut your eyes and note the sounds around you. It doesn't need to be silent to meditate; sounds can actually help you in your practice. You can then begin to scan your body, observing what you're feeling in each area. You're not meant to alter anything, but rather just observe areas that might be more tense than others, or areas that are particularly relaxed. All of this is simply an effort to get you to actually stop and realize what state your body is actually in, as too often we're going through our days without even really paying attention to our bodies. After checking in with your body, you now move on to simply watching and observing your breath. You don't want to change your breath, which tends to happen when your think about your breathing. Instead, just notice it's natural state. Is it shallow or deep. Slow or fast? The goal is to keep your focus on the breath and the sensations your breath causes in your body. Thoughts may come and go still. Meditation isn't about preventing or squashing the thoughts, just about letting them pass by like cars without mentally running after them. If you lose focus on your breath, you just have to refocus once you realize. After all, once you've realize you lost focus, you're already being mindful and aware again. The book had several other tips and practices, as well as sections on how to apply mindfulness to your daily activities. They even developed an app to guide you through a ten minute practice for ten days! I've downloaded the app and my first few sessions have been going pretty well. Now that I have a basic idea of mindfulness and meditation practices, I've been looking at ways to incorporate it into my Bullet Journal. One of the biggest challenges when starting to incorporate a new habit is, as Andy Puddicombe put it, "remembering to remember." To help with this, I'm adding meditation practice to my weekly habit tracker. Seeing it each time I open my Bullet Journal with help keep it front and center in my mind. As for the actual meditation practices, the book includes a small worksheet for each practice session to help you record how you felt. Having to write down your feelings requires introspection in order to actually know what to write, so it's a great tool to help kickstart your mindfulness habit. I'll be creating a spread in my Bullet Journal to record how my meditation sessions go, and maybe even for periodic checks throughout the day. I still do think that just keeping a Bullet Journal has made me much more aware of where my time is going and what I'm doing with my days. It's been an integral part in recognizing how I can live in accordance my goals. However, I am now also going to work to include more mindfulness in the everyday, mundane tasks. After all, life is about the moments that make it up, not just the big events. The good and the bad and everything in between deserve equal acknowledgment and appreciation in order to see the big picture of our lives. What are your favorite ways to incorporate mindfulness into your lives?